AmPhiOscal is a highly concentrated liquid mineral and trace element solution. It provides mineral nutrients essential to fertility, reproduction, eggshell quality, bone formation, good functioning of the nervous system, fat and carbohydrate metabolism, and mobilization of energy, growth and resistance. Minerals and trace elements play major roles in all metabolic function. 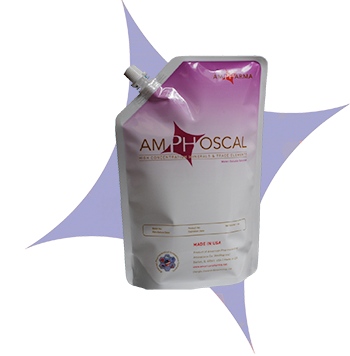 AmPhiOscal is a maximum-strength balanced formula of liquid minerals that helps in reversing and overcoming stressful conditions such as heat stress, dehydration, infectious diseases accompanied with loss of minerals, diarrhea, and starvation during growing and laying periods. AmPhiOscal can be used as a supplement to compensate for mineral deficiencies. AmPhiOscal supplies essential minerals and trace elements that are important in improving feed conversion and metabolic functions. Phosphoric Acid, Cobalt Chloride, Magnesium Chloride, Sodium Chloride, Calcium Chloride, Manganese Chloride, Zinc Chloride, Copper Chloride, Ferrous Sulfate, Phosphorus (Phosphoric Acid), Calcium (Calcium chloride), Sodium (Sodium chloride), Magnesium (Magnesium sulfate), Iron (Iron chloride), Copper (Copper sulfate), Manganese (Manganese sulfate).